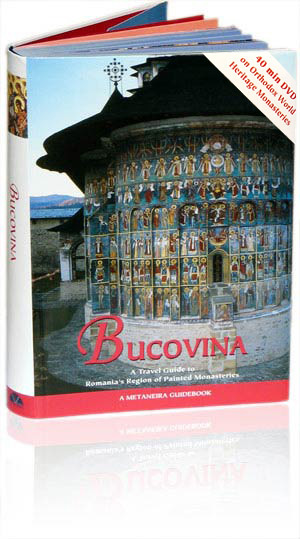 Bucovina – A Travel Guide to Romania’s Region of Painted Monasteries is a travellers’ guidebook, presenting the beautiful monasteries and churches of Bucovina. These churches are unique in the world for their fully frescoed exterior and interior walls. The feature, which will make this guide to stand out from the others, is the inclusion of line drawings of these frescoes. These “maps” of the mural paintings show the scenes depicted on the walls, subjects identified, and outlines sketched in ink. Usually travellers can only admire the scenes, but cannot interpret their meaning. Besides the monasteries, the guidebook outlines in great detail the traditional way of life of the region, the history of Moldavia and Romania , and the traits of art, architecture and religion in this area. Further, there is practical travel information on where to go, what to see, how to get there, and a short vocabulary of the Romanian language. The guidebook is unique in its kind as there is nothing available in the market that tells you, in a way that is precise and scientifically correct, what the paintings show nor what they meant when they were created. Moreover, information that explains how certain scenes came into the iconographic canon and why, and how they were related to the local folklore and contemporary 16th and 17th century life is available only in scientific essays that are not available for the large public. As in the case of all our books, the language chosen for the guidebook is English. Further, the guide includes a 40-minute DVD with scenes showing the life in the Bucovina monasteries and villages. The DVD comes with the guidebook, without any additional cost. The first part of the book is divided into four chapters: Geography, History, Life and Style, and Art, Architecture and Religion. Here are found extensive texts on the background and history of Moldavia and Bucovina, in relation to both Romania and Europe. These chapters describe the phenomenon of the painted churches, why they were created, and what was the historical context. 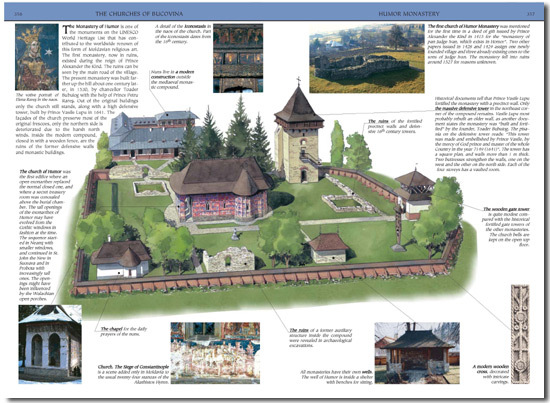 But not only history and monuments are handled here, but the everyday life and customs of the people of Bucovina is explained and illustrated with photographs and drawings. The second part of the book describes 18 of the most significant monasteries and churches of Bucovina, and six others in nearby Neamţ County. 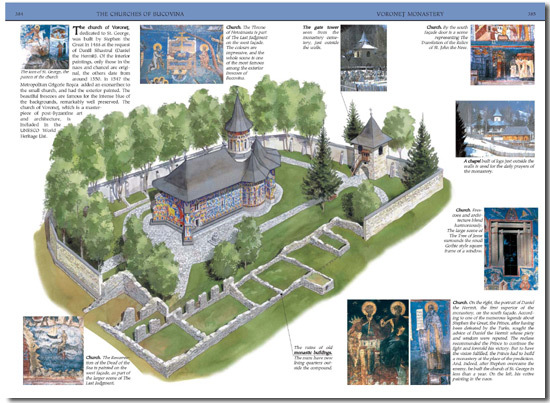 For each monastery there is an explanatory text, along with photographs of the church, the compound and the wall paintings, and for the most important ones there are also detailed three-dimensional illustrations and cutaways. 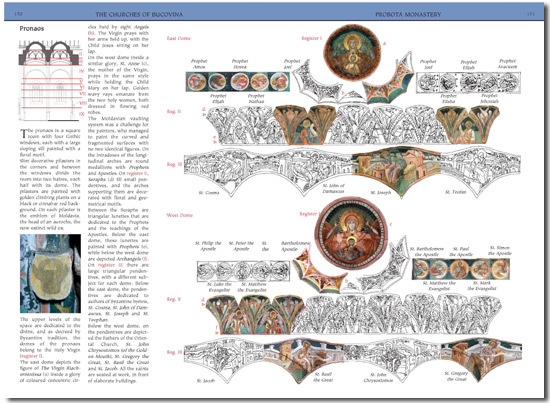 A unique feature is the line drawings, made especially for this book, of the interior and exterior frescoes of the most representative churches. These line drawings are detailed and full of information, and will help the reader to identify scenes, which are painted high up on the walls, or may be difficult to locate among the profusion of frescoes. 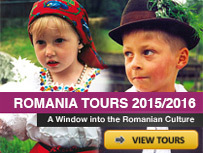 The last part of the book gives practical information and tips on travel to and in Romania. Here are chapters on what to see, where to stay, what to buy and to eat, to get the most of Bucovina. The hotels and pensions that are most conveniently located to tour the monasteries are described. Other types of accommodation available in the area are described, such as cottages, farmhouses and camping sites. To help tourists and travellers, there are maps of the surroundings of the larger towns with local attractions and sites to see marked on them. Altogether there are 784 full-colour photographs in the guidebook. In addition there are 347 colour and black and white drawings, as well as ten aquarelles made especially for this book, to render it more useful for the traveller. 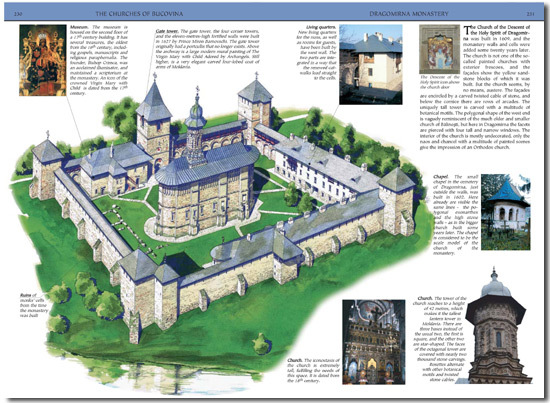 There are special openings on the different architectural features of the monuments, windows, doors, towers, and monastic buildings, illustrated with examples of stylistic differences and drawings. Further, there are openings with drawings on such subjects as Prehistoric Moldavia, The Dacians and the Romans, Stephen the Great, Petru Rareş and the Painted Churches, Moldavia and a United Romania, Soba – the Heart of the House, The Traditional Farmyard in Bucovina, and Sheepfolds of Bucovina. I wish to visit the hermitage sihastria at the rarau mountains. I had a vision about the place last year. And the images match my vision. Can anyone help with directions please? But now living in Toronto I meet the other Europeans and it feels good. iam a canadian romainian leaving on vancouver island canada would like to connect to ny romainian before i travel there. is there anybody out there that can help me with this.